The strap that is shown in the picture of the watch on this page is not correct. The actual strap is black with white contrast stitching and not black stitching. 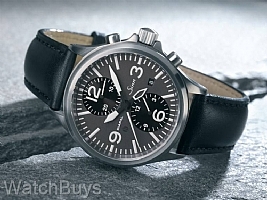 Verified Owner Comments: Sinn definitely hit this one out of the ball park with the design! The legibility of the dial is off the charts. The black background of the subdials and the date window make the chronograph functions and date easy to read at a quick glance. Additionally, they are nice contrast to the gorgeous anthracite dial and add a bit of pop to the overall look. I wondered if I would miss having a second hand but I haven't! In fact, not having one on this watch makes the dial even more legible. In terms of overall size, this watch hits the sweet spot for my 6.5 inch wrist on a warm day. This is a watch I will definitely enjoy wearing immensely! Verified Owner Comments: Beautiful, Simple, Understated watch design that is packed with technology. The leather strap is nice, I switched it for a Nato, but will wear the leather to dress up the watch as needed. My 756 keeps great time, +-2 sec/day on my wrist. I had a minor issue with the watch and Watchbuys went out of their way to rectify the issue. All in All a great watch. "A classic of form and function"
Verified Owner Comments: The Sinn 756 DIAPAL ranks very highly in my watch collection, including Sinn and all others. With its DIAPAL watches, Sinn once again demonstrates its commitment to advanced technology. 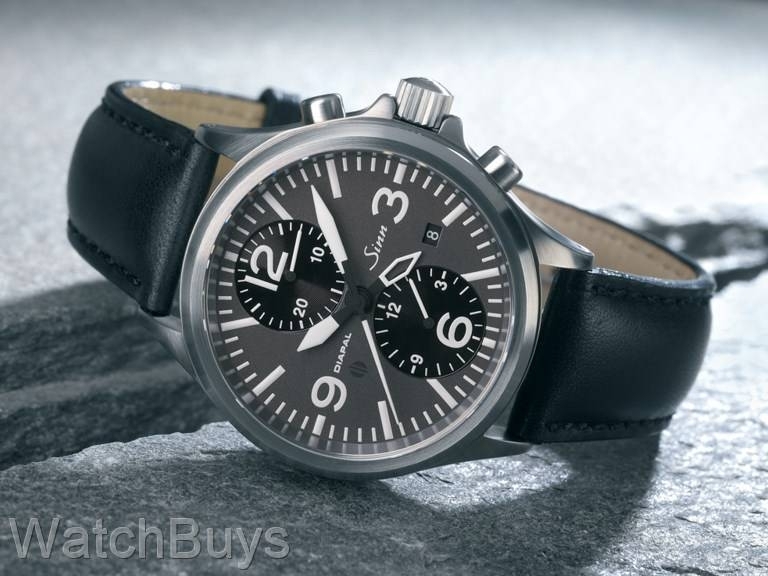 Here they have created an amazingly clean, pared down and thoroughly useful chronograph which I am very much enjoying. Soon after my purchase, I switched to the bracelet made for this watch, which was a great choice. Very comfortable, a great size for my wrist, and a pleasure to use! Verified Owner Comments: I absolutely love the proportions of this watch. The modest yet classic diameter has a much larger presence due to the thick case and deep set dial. The stunning dial color combination exclusive to the Diapal is enhanced by a whisper of blue added by the AR coating giving it a P-51 cockpit feel. I find that I don't miss the running second hand which is usually relegated to a small sub dial on most chronographs. If I want animation I just click on the chrono and stare as the long, luminous, central hand glides across the face! This one will get tons of wrist time! "Clean look and easy to read"
Verified Owner Comments: Love my watch and wear it nearly every day. Clean look and easy to read,solid case and precise timekeeping. This watch is all that it was represented to be. Robust-I am a machinist and wear the watch every day. The shop hasn't yet been able to dent or scratch the crystal or case. Accurate-the watch gains 2 minutes a month.